Rambling Through Parenthood : We went to Diggerland! Where is the best place to take someone who loves diggers? Diggerland, of course! Diggerland is not your ordinary theme park. It is an adventure playground where all the family can get hands on with real full size construction machinery. You can operate a giant JCB digger or get behind the wheel of a dumper truck (as long as you are over the minimum height). My four year old little boy can’t seem to get enough of tractors and diggers. Needless to say, he was over the moon at the prospect of visiting Diggerland. We chose to go to the Yorkshire site, as it is convenient from where we are. The unpredictable British weather caught up with use by the time we arrived. I had packed a picnic and I was pleased to find out there was a nice indoor picnic and soft play area. So we headed there to shelter from the rain and eat our picnic. Tummy filled, J was happy to run up and slide down the enormous slide. 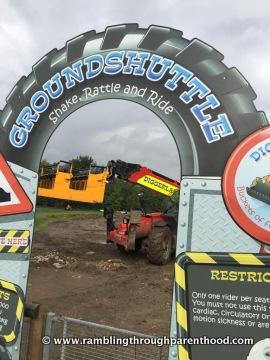 The skies soon cleared, and we were able to head out to explore all that Diggerland has to offer. It wasn’t busy at all, (something to do with the rain, perhaps?) and we were able to have a go on most things without waiting in long queues. J was not tall enough to go unaccompanied on a few rides and M was only too happy to get in the driver's seat. The boys had an absolute blast driving first a tractor and then a dumper truck. They then headed to the Robot Driving area, where they got to drive a robotic contraption through mounds of muck. I don’t know who was happier with all the machine-driving, my guess is M. Don’t they ever grow-up, these boys? J wanted to have a go on the go-karts and he was tall enough to drive by himself. He wasn’t too sure though, having never driven one before. M to the rescue, once more. Having done a couple of laps with Baba perched behind him, J was happy to drive the go-karts by himself, once, twice, three times. We had to pry him off them after a point. It was my turn next. Not being much of a digger/dumper/tractor person, I was manning the camera all along. The GroundShuttle looked innocuous enough, and I suggested we all hop on. We did, and boy, were we in for a surprise! I will not play spoil sport, just believe me when I say this is no ordinary shuttle! The highlight of the day was, of course, the full-sized JCB diggers. My boys would have just stayed there all day if I had let them. What made the experience even more fun was the really enthusiastic young man in charge of the giant diggers. If ever there was someone who loves their job, it has to be him. M and J had the time of their life operating this enormous piece of machinery, digging, lifting, scooping, dumping mounds of mud. We all had a turn on the Sky Shuttle, which took us high above the treetops, giving us a spectacular view of all of Diggerland and beyond. Then there was the little train and Safari experience, all good fun. We even managed to ride a real JCB digger, which, according to J, had a breaker and a scoop just like in his book at home. The day was drawing to a close, but not before we all had a go hooking ducks, digging for hidden bricks and knocking skittles with the help of some mini diggers. J was brave enough to operate them on his own and scooped out all the hidden treasure. We were so very proud! Diggerland proved to be so much more than I had anticipated. We had the most amazing time and left with huge smiles on our faces. Where else in the world would we ever had the chance to operate a real JCB digger? Fabulous concept, well executed. I can highly recommend a visit, it is well worth the money. Just one thing; please wear welly boots and clothes that you do not mind getting mucky. They so will! Disclosure: We were guests of Diggerland UK for the purpose of this review. All opinions are my own. My boys used to love Diggerland and even now ask if they could go again one day. 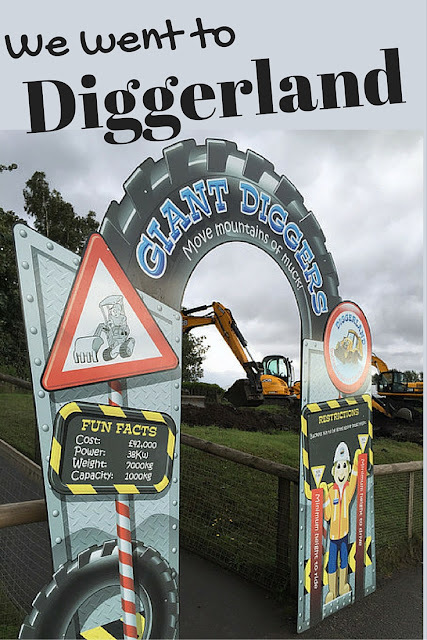 I confess, I have never been to Diggerland and with twin girls it's unlikely I'll ever make it but I wish we had given it a go, it looks so much fun! Oh it sounds like it is a LOT of fun. We must visit our local one. It sounds like my boys would really enjoy a day out there. I have been meaning to visit for ages as I have a digger loving toddler, it looks brilliant! We had an amazing time in Diggerland in Kent - who knew driving diggers would be so much fun? Oh this sounds absolutely brilliant, what a fantastic day out. POD would love to visit - she already has a passion for driving even at four. Slightly worrying! This looks like a super day! I must take Leo! Oh this sounds awesome! My little girl would love this. I must take her.